Tooele High School senior guard McKenzie Alvarez (21) dribbles in transition Thursday against Morgan. 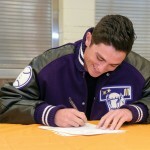 The senior scored 7 points against the Trojans and 6 against Ogden last week. After a pair of losses to Morgan and Ogden last week, the Tooele girls basketball team is still only one game behind Stansbury for fourth place in Region 11 and a playoff game. 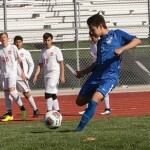 The only problem for the Buffaloes is that the Stallions finish the regular season against the two weakest teams in the region with a home game against Grantsville on Tuesday and a road game at Ben Lomond on Thursday. The Buffaloes do get Ben Lomond at home on Tuesday with a road game at Bear River on Thursday. Even if they sweep those games, they would need Stansbury to lose one of its final two region games. 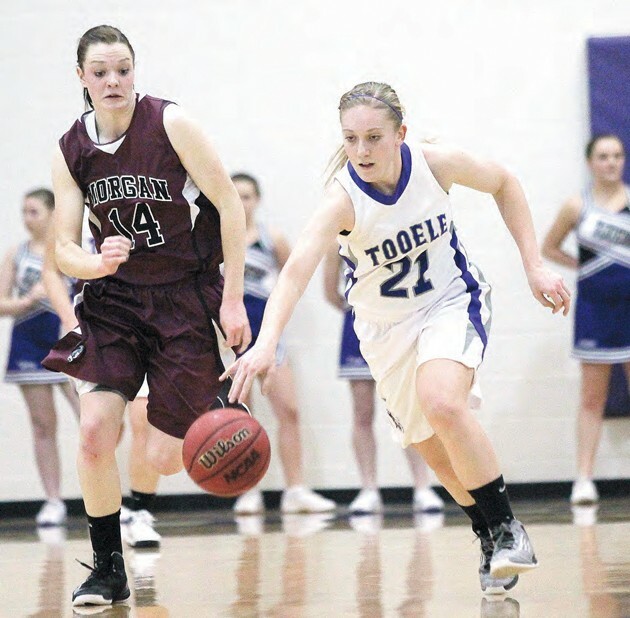 Tooele lost at home to Morgan 54-37 on Tuesday and dropped a game at Ogden on Friday night on 62-43. The Ogden score was a bit deceiving. Tooele trailed the Tigers 28-26 after three quarters when Taylor Thomas nailed a 3-pointer from the left-angle to close the gap. The Buffaloes trailed by 5 at 36- 31 with 5:12 left in the contest. But the Tigers owned the final 5 minutes of the game mainly because they were able to hit foul shots and layups with the Buffaloes needing to increase the pressure on defense and foul to have a chance. Both teams shot the same percentage from the foul line in the Ogden game. But the Tigers took 28 foul shots compared the Buffaloes’ 14 foul shots. Ogden hit 18-0f-28 attempts while the Buffaloes connected on 9-of-14 foul shots. The Buffaloes outscored Ogden 16-13 in the first half with a strong second quarter. McKenzie Alvarez and McKae Searle hit a pair of jumpers in the first quarter while Baylee Hansen sank two free throws and Tooele trailed 7-6 after one. After Ogden grabbed a 9-6 lead early in the second quarter, the Buffaloes responded with 8 consecutive points on a 3-pointer from Alvarez, an inside basket by Fofoa Ungor, two more foul shots from Hansen and a foul shot Searle to make it 14-9 Buffaloes. Tooele led 16-13 at intermission when Thomas knocked down a baseline jumper for the finals points of the half. It got a bit rough in the third quarter when Courtney Schiwal was pulled down by an Ogden player. On the play the Tigers scored to slice Tooele’s lead to 16- 15. Thomas made a great inside spin move to score and keep her team out in front at 18-15 with 6 minutes to go in the third quarter. Victory still was within reach for the Buffaloes when Hansen received a sweet pass from Rylee Hansen for a bucket to stay out in front at 20-17. Ogden fought back though when senior guard Kelsey East and junior forward Allie Hyde started to heat up from outside. Ogden outscored Tooele 11-3 in the final minutes of the third quarter until Thomas drained a 3-pointer to narrow Ogden’s lead to 28-26. The score was tied with 7 minutes to go, but the Tigers ended up outscoring Tooele 34-17 in the final quarter. Hansen scored 14, Thomas 9, Schiwal 7, Alvarez 6, Searle 5 and Ungor 2. Ogden’s Kelsey East got the hot hand in the second half and led all scorers with 17 points including three 3-pointers. On Thursday, Morgan was able to shake off Tooele in the second quarter by outscoring the Buffaloes 18-5 after they stayed with the region leaders in the first quarter. The Trojans led 14-11 after one and 32-16 at intermission en route to the victory. Schiwal led the Buffaloes against the Morgan with 13 points. 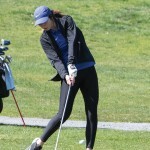 Alvarez scored 7, Thomas 6, Amber Haskell 4, Hansen 3, Searle 2 and Whitehouse 2. Haskell did not play at Ogden out with a foot injury she suffered in the Grantsville game. She still played, however, in the Morgan game.